What are greenflies? Greenflies are simply another name for aphids– tiny pests that wreak havoc in gardens and farms around the world. If you’re from the United States, you probably refer to the tiny monsters as aphids, while gardeners across the pond know them as greenflies, blackflies or whiteflies, depending on the species. Now that we’ve sorted out the difference between greenflies and aphids, (there really is no difference), let’s consider a few aphids and greenfly facts. In some areas of the world, greenflies, or aphids, are known as plant lice, which is an appropriate name for the tiny bugs that gather en masse on leaf joints or the underside of leaves. The eggs usually hatch in early spring and immediately get busy sucking the sap from tender, new growth. As the weather gets warmer and the greenflies sprout wings, they are mobile and able to travel to new plants. What do greenflies do to plants? If they aren’t controlled, they distort the appearance of the plant and can considerably stunt plant growth and development. Although they are rarely deadly, they can seriously weaken the plant if left uncontrolled. 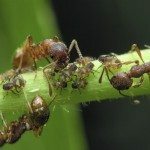 Ants and aphids have a symbiotic relationship in which ants gobble up the sweet sap, or honeydew, that aphids leave behind. In turn, the ants ferociously protect the aphids from predatory insects. In other words, ants actually “farm” the aphids so they can dine on the honeydew. An important aspect of aphid greenfly control involves monitoring and controlling the ant population in your garden. The sticky honeydew also attracts sooty mold. Regular application of insecticidal soap or neem oil is also an effective greenfly aphid control with little risk to beneficial insects. However, don’t spray plants when good bugs are present. Avoid pesticides, which kill beneficial insects and make aphids and other pests more resistant.